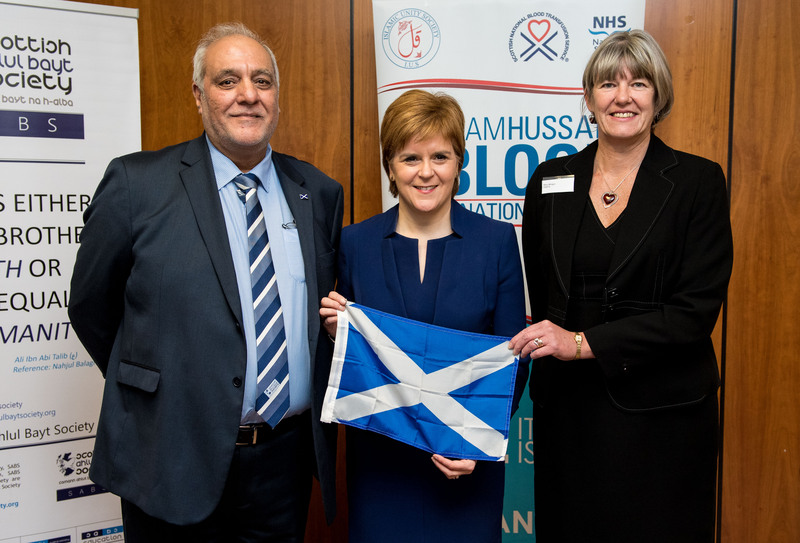 The Scottish Ahlul Bayt Society are proud to work in partnership with the Scottish National Blood Transfusion Service (SNBTS), NHS National Services Scotland and the Imam Hussain Blood Donation Campaign (Scotland). Our joint objective is to raise awareness of the need for blood donors in Scotland. Currently, less than 4% of people in Scotland give blood. Together we conduct annual blood drives, and throughout the year encourage donations by raising awareness in the public domain – across third sector organisations, political and diplomatic bodies, faith and no-faith based organisations, and religious and minority-ethnic communities – of the growing need for more blood donors and the short-shelf life of blood components. The mission is rooted in three aims: saving lives, public outreach to urge people to become regular donors, and caring for the human family; the promotion of peace, harmony and fellowship with all segments of society; and sharing the universal values upheld by Islam – and embodied in the holy personage of Imam Hussain (the grandson of the Prophet Muhammad) – of compassion, giving and good will. The SNBTS is Scotland’s blood, blood product and tissue provider and, are committed to ’Meeting the Transfusion Need of Patients in Scotland’. Their service is invaluable and without donations many medical and surgical procedures could not possibly take place. 2006 – Imam Hussain Blood Donation Campaign brand launched in England. 2017 – Oct/Nov – The Imam Hussain Blood Donation Campaign Scotland which has been running in Edinburgh for 3 weeks has now come to a close. We thank the Scottish National Blood Transfusion Service for working with us on this project and for their insurmountable efforts in the last 5 years over which this campaign has ran in Edinburgh. This year the campaign has seen a record number of over 260 donors and a great many potential lives saved as a result of their selflessness. We thank all those who came! We were pleased to also have Frank Ross, The Rt. Hon. 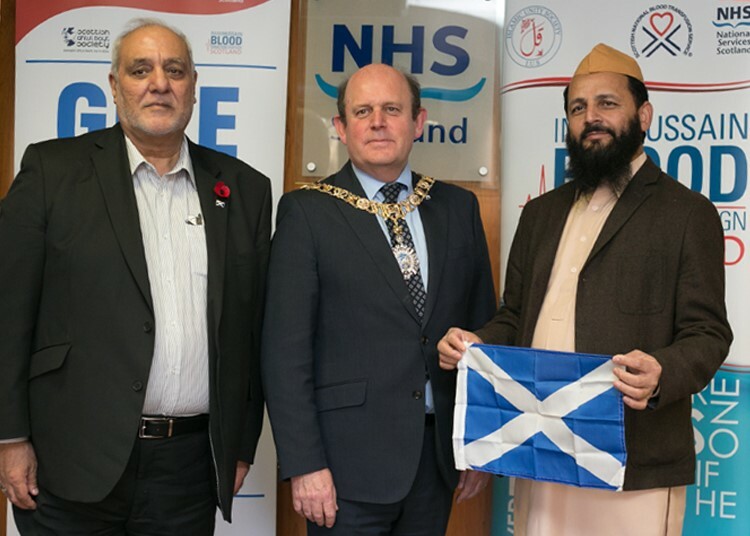 Lord Provost and Lord Lieutenant of the City of Edinburgh and other dignitaries across civic, community, and diplomatic sectors support the life-saving cause. Our aim is to encourage regular blood donors, in remembrance of Imam Hussain [a] and his pure mission. We hope to see you at our next campaign, and in the mean time encourage you to continue donating! 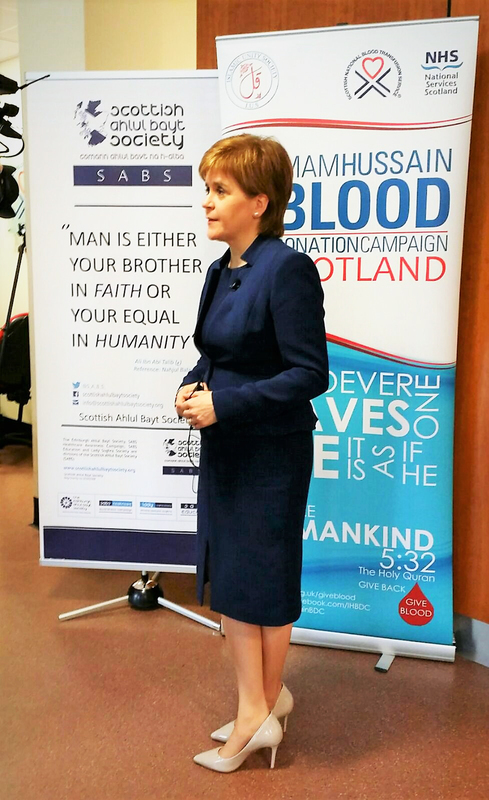 2018 – Jan – First Minister of Scotland Supports the Imam Hussain Blood Donation Campaign Scotland. 2018 – March – Well done to the Islamic Society of Edinburgh University for participating in the Imam Hussain Blood Donation Campaign Scotland and donating blood to save lives. 2018 – October – Kash Farooq, British Boxing’s bantamweight titleholder, becomes the Ambassador of the Scottish Ahlul Bayt Society and the Imam Hussain Blood Donation Campaign Scotland. 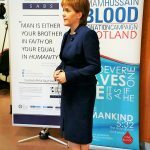 2018 – October – Imam Hussain Blood Donation Campaign Scotland, Muharram drive kicks off, taking the campaign in Edinburgh into it’s 6th year! 2018 – November – 2018 Being Human Festival; Bloodscape – Scavenger hunt exploring changing blood trends. 2018 – December – SABS MSP Briefing: Scottish sports working together to save lives and promote blood donation. 2019 – SABS 2 day Blood Donation Campaign took place on the 28th February and 2nd March in Edinburgh. Click here and click here to read the full story. In the 6 years in Edinburgh alone, the campaign has generated over 2,100 donations so far. As each donation can be split into three separate parts (red cells, platelets and plasma), this means up to 6,300 lives have been saved or improved in Scotland. 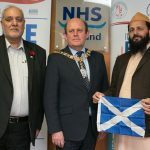 Additionally, annually, as part of World Blood Donor Day – a global campaign of the United Nations’ public health arm, the World Health Organisation – the Scottish Ahlul Bayt Society initiates a national outreach project in partnership with the SNBTS. For World Blood Donor day, we ask for the support of our networks across all sectors and the citizens of Scotland by posting letters reminding them of the need for regular blood donations and the locations of donor centres. Blood is something we all expect to be there for us when we need it, yet only 4% of us give blood. Blood donation services help patients suffering from life-threatening conditions live longer, and they thus play a crucial role in saving those who have suffered accidents during man-made and natural disasters, as well as in maternal and child care. The service is of immense value and without regular donations a number of medical procedures would not be possible. Thus many people would not be alive today if it wasn’t for the generosity of donors. Most people can give blood, but all donors have to meet the eligibility criteria before their blood is accepted to ensure there’s no risk of us harming you or the patients who will receive it. If you’ve never given blood before you’ll probably wonder what Blood Donation Sessions are and what happens there. They can take place at regular intervals at your local community centre, church, sports club or even daily at one of our permanent sites across Scotland. The SNBTS has five permanent Donor Centres in the following locations: Aberdeen Donor Centre, Dundee Donor Centre, Edinburgh Donor Centre, Glasgow Donor Centre, and Inverness Donor Centre. In order to determine whether you are eligible to donate blood and save lives, try out the quiz here.